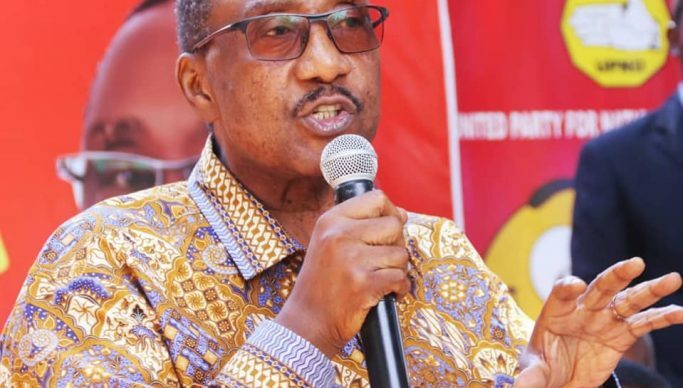 OPPOSITION United Party for National Development vice-president Geofrey Bwalya Mwamba has dismissed speculations that he has fallen off with leader Hakainde Hichilema. And GBM said it was difficult to imagine that a sane person would aboard a sinking boat. Some online reports have claimed that GBM was not in talking terms with Hichilema and some senior party officials and that he was on his way back to the PF. Speculations indicate that Mwamba has been offered K50 million to rejoin the ruling party. But during a joint news conference with Hichilema, Mwamba said the reports were untrue. “There has not been any differences as peddled by enemies of our party and progress, both within and outside. I am still enjoying a wonderful relationship with my brother President Hakainde Hichilema and our great party, the UPND,” he said. “The doomsayers should be ashamed for their mechanisations to promote disunity in our party, going to an extent of suggesting that I have been bribed by a party that lacks principles, decorum and common decency to governance and the people of this great nation”. GBM prides himself as a principled man who had no intentions of rejoining the PF. “When I made that decision to support the ideals of HH and the UPND, I did it with all my conscience and faculties intact and nothing has changed and need I emphasise here, I cannot be bought by a bunch of crooks as I believe in earning my money through hardwork and legal means and not handouts. I give, not take. I came into politics already successful and so unlike others I am able to say I am incorruptible,” he said. “So, to all of you, I am VP of UPND and will remain so until the party decides otherwise,” he stated. And Hichilema has dispelled assertions that GBM had resigned from his position. The UPND leader also used the opportunity to call on party members across the country to remain united and focus on mobilisation and growing the party. He said Zambians are looking up to us for social and economic development and we will not let them down. “UPND remains an organised institution whose values include working for the people and not ourselves as leaders and as such we appeal to all party officials and members across the country to remain united,” Hichilema said. At the same briefing, Hichilema stated that the Alliance which the party entered into does not in any way mean that it will replace any of the leaders but that it is a joint venture to check the PF on its evil schemes. He said that no UPND leader, MP, council chairperson, councillor and all party officials must feel displaced or side-lined. “We are an independent institution. UPND is ready to run our country better than the PF led by Edgar Lungu. As a party by the people for the people, for us it’s Zambia and Zambians first,” he said.